Whew! November came and went in just a few blinks. Maybe because I was on vacation enjoying the clear waters of Coron, Palawan in the Philippines, and the temples of Bangkok, Thailand. I am so thankful to be back because there’s no place like home. It’s not only on Thanksgiving Day that I am grateful with my loving and supportive family and friends, but I am thankful for them everyday along with all the blessings that He has given and continues to give me. With turkey day in the books, we look forward to my favorite month of the year, December. A month where you get to see family that you haven’t seen in a long time, and find presents under the Christmas tree. Maybe play Santa Claus to the kids, and make memories that will last a lifetime. Nana hugs and kisses him. After breakfast, Michael leaves to have a business lunch with his assistant at Koho’s. “Tuesday, I have a birthday dinner to attend to at Binhi At Ani. Don’t book anything in the afternoon. In fact I need to look for someone. Her name is Angel but I don’t have her last name yet. I need a background check done before Tuesday,” Michael looks at Tyler for affirmation. “Ok, I can move the Dela Cruz’s appointment to Tuesday morning,” says Tyler. Michael gets in his car and drives to the other end of Kahului where he brought the two women last night for the lualo (prayer), hoping to see Angel. Michael drives up and down the kalye (street) of West Kaua‘i, trying to tap into his memory bank. Michael knocks on the door. “I’m coming,” a voice shouts in the back. His heart is pumping. “OMG, what if it’s her?” He looks into the glass to fix his buhok (hair) and collar. “OMG you are even uglier in the buntag (morning). Come back later when it’s dark.” She closes the door. Michael stutters not knowing what to say. Rosie looks around. Closes the door. “She’s not really my sister,” and smiles. “Oh no, you don’t look anything like Angel. Haan (No) to a twinsies,” Michael thought to himself. Rosie tilts her head and raises her eyebrow. “Angel, Angel, Angel.” Rosie says and stares. “OMG, Palito. I only say her name and you become like a ghost. Stop that. It’s really weird. Get a grip, she’s not that much prettier than me anyways,” tossing her buok (hair) in the air and rolling her eyes. “Uh, hold on, wait… ” Michael stumbles after her. On Maui, we have the bus. It is used by many locals to get around the island. When is the last time you rode the bus? Go ahead, make plans this weekend and travel to Lahaina, Kīhei, or go to Kahului like Rosie and Angel. Support our public transportation service on Maui! Tell us your favorite bus stop story at www.facebook.com/letstalkpinoy. This month’s homework is to say “Merry Christmas” everyday to someone new. 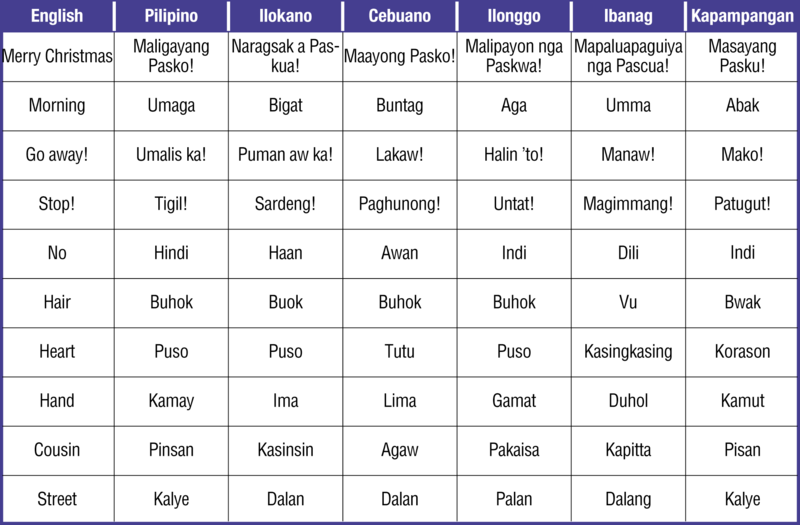 Look in the table how to say it in different Filipino languages. Teach them and have them say it back to you. ‘Tis the season of giving, and you can give the gift of language! Anyways that’s all I have. Keep an eye out for my article every issue. 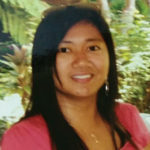 I’m Dulce, helping you to master your Filipino Languages. Like always, let’s laugh, let’s listen, and Let’s Talk Pinoy! Hanggang sa muli! (Until next time!) Ingat! (Take care! ).